North Wales head-quartered Jackson Fire & Security have been awarded a contract to install a wireless fire alarm system to Westbury Castle near Prestatyn, a 200-year-old Grade II listed property, previously described as Wales’ Downton Abbey. It was once the ancestral home of the aristocratic Mostyn family, who built the main house in 1880s, and is now being refurbished to offer weddings, parties and private functions. The fire and security specialists will fit and commission a wireless fire alarm system, allowing for minimal disruption to the castle and a discreet installation to ensure no compromise to the beautiful interior. 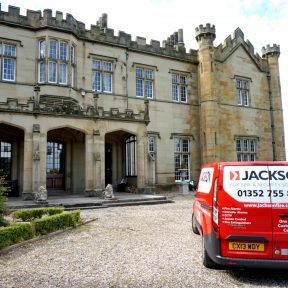 The contract win continues Jackson Fire & Security’s successful track record of providing fire safety services for wedding venues. The company, which operates throughout North Wales and Cheshire, recently installed a new fire alarm for Successfactory following their approval to offer civil ceremonies at their picturesque location in Burwardsley near Chester. As part of the contract, Jackson Fire & Security will be carrying out a full fire risk assessment of the historic building together with the supply and commissioning of fire extinguishers for the castle. 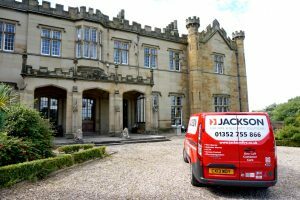 Manager of Westbury Castle, Janet Evans said: “Jackson Fire & Security are well-established throughout North Wales and had come recommended to me during my search for a local fire alarm company. Founded in 1991, Jackson Fire & Security employs 40 people across 10 branches in North Wales, North West England, Yorkshire, the Midlands, Teesside, Cambridgeshire and Surrey. The Mold-based company provide a one-call service whereby our engineers service fire and security systems, plus emergency lighting and fire extinguishers during a single visit, to save inconvenience and site attendance fees for customers. One of the UK’s leading independent providers of fire and security systems, Jackson Fire & Security are NSI Gold approved for fire and security systems.